New Hampshire Gov. 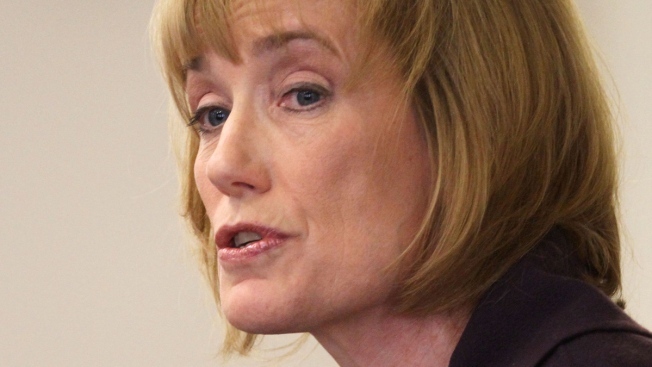 Maggie Hassan has announced she's running for the U.S. Senate. In an online video released Monday morning, the Democratic governor says she's running to get a response from Washington that matches progress New Hampshire has made in promoting business innovation and expanding economic opportunity. She says Washington has given in to powerful special interests and lobbyists "who rigged the system for themselves and against the middle class." The second-term governor is the first Democrat to announce she's in the race to challenge Republican U.S. Sen. Kelly Ayotte. The 57-year-old Hassan is considered the best challenger for Ayotte in a swing state that could be pivotal in the contest to control the Senate. Ayotte was elected in 2010. She says she expects a "very spirited campaign." New Hampshire Republican State Committee Chairman Jennifer Horn was quick to respond to Hassan's announcement. "Governor Gridlock Hassan is trying to leave the corner office after years of failing to lead on the pressing issues facing New Hampshire," she said. "Hassan's playbook of more taxes, more spending, and bigger government has not worked for New Hampshire families and small businesses. Her failed leadership has brought Washington-style gridlock to the governor's office, and the last thing New Hampshire needs in the Senate is another rubberstamp for more partisan politics." New Hampshire Democratic Party Chair Ray Buckley released a statement praising Hassan's leadership as governor and criticizing Ayotte. "Washington is broken and special interest favorite Kelly Ayotte is part of the problem," he said. "Since going to Washington, Ayotte has put her special interest backers first, protecting tax breaks for big oil companies and outsourcers while voting to turn Medicare into a voucher program, defund Planned Parenthood, and make higher education more expensive. House Democratic Leader Steve Shurtleff also issued a statement praising Hassan for her service as governor. "Governor Hassan has proven that she will always act in the best interests of the people of New Hampshire and that she will continue to put their best interests ahead of partisan politics," he said. "It has been a pleasure to serve with Governor Hassan and I am confident that she will make a great United States Senator. As happy as I am for the Governor, I am even happier for the people of New Hampshire." Hassan's decision leaves the race for New Hampshire governor in 2016 wide open. Executive Councilor Chris Sununu, a Republican, announced last month that he will run for governor. Sununu is the son of former Gov. John H. Sununu and the brother of former U.S. Sen. John E. Sununu. Republican state Rep. Frank Edelblut has also formed an exploratory committee. Executive Councilor Colin Van Ostern, a Democrat, issued a statement Monday praising Hassan and saying that he expects to announce "in the coming days" if he will run for governor. He said his experience gives him "a good perspective on how we can keep New Hampshire a great place to work and raise a family." Democrat Stefany Shaheen, daughter of former governor and current U.S. Sen. Jeanne Shaheen, is also considering a run.